i’m a runner. I’m not fast. My stamina is so-so, I don’t have celebrity endorsements or products named for me. But I run when I can because it makes me feel good. I love being able to do things I couldn’t do before and when I run, I #sweatpink (click here for more information if you’re unfamiliar with the SweatPink brand. 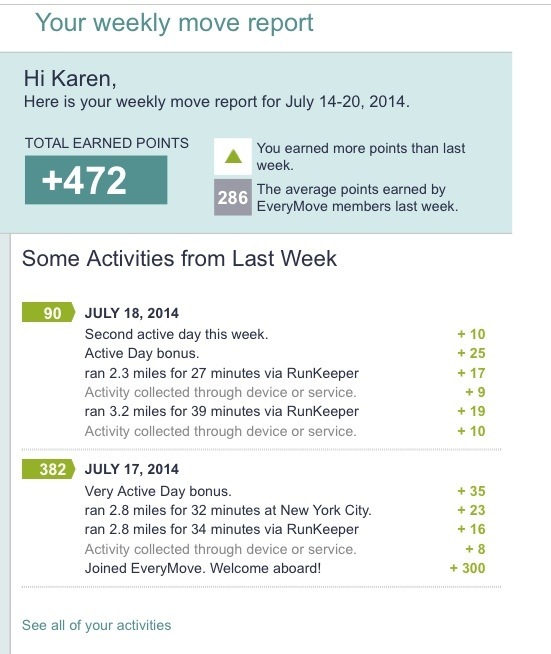 I typically use the Runkeeper to record my runs and track my progress but because there are so many different apps and GPS devices that do similar things, I don’t have a lot of Runkeeper friends. Thank God I have a few faithful supporters on Runkeeper who give me a virtual high-five whenever I do well on my runs but I am always hoping more of my running friends would join me online so we could cheer each other on. That’s why I love what Every Move did. If you use Runkeeper, or Nike Plus, or your Garmin, if you use Fitbit or Jawbone or any of a myriad of different kinds of devices, you can enter your activity into Every Move to share with the entire running/biking/anything community. Finally! I don’t have to be alone anymore! And… if you’ve been reading for a while, you know I’m passionate about helping people, and serving others. Every Move provides an opportunity to use your miles to help others. 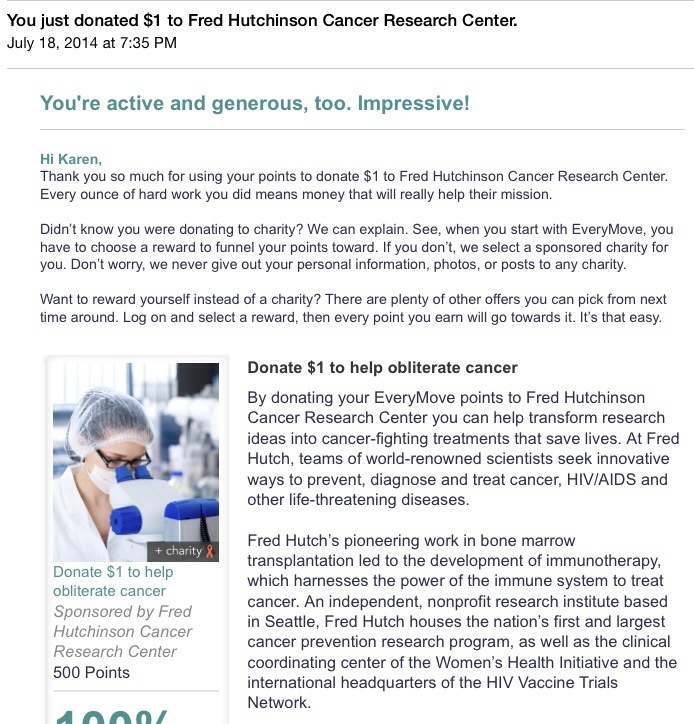 I chose to exchange my “rewards” for charitable donation for the Fred Hutchinson Cancer Research Center. 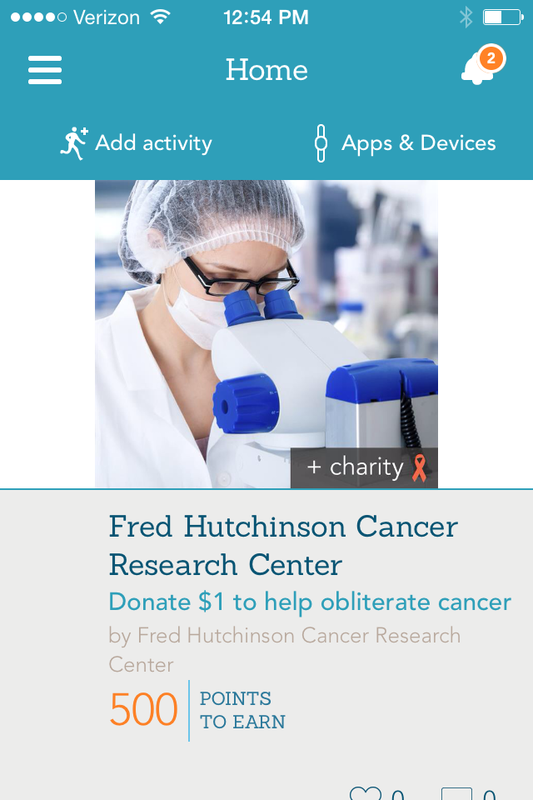 Again, if you’ve been reading for a while, you know I am passionate about fighting cancer – I’ve lost too many family members to the dreaded disease. I can’t do much but I can run for the cause. And Every Move allows me to do that. I still don’t know everything the app has to offer – I am learning – but I like that it syncs with my existing network, creates a wider community for me, bigger than I even imagined. With not much more than a few clicks, the entire running community became my supporters and I became a charitable donor. And because this isn’t just for running and I get rewards for any kind of activity that I log, i’ll be even more motivated to add my cross training events too. Look for my profile here and add me. Disclaimer: As a Sweatpink ambassador, I was asked to download the free EveryMove app and test it out during my workout. I was not compensated for this post but I feel like I earned something because the Every Move app has made my running experience that much better.